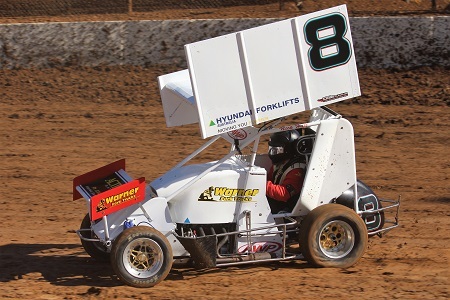 Following his win in the Zeke Agars Classic earlier this year Nick Hall wrapped up his second major V6 Sprint feature of the Murray Machining and Sheds Murray Bridge Speedway season as he captured the Des James Memorial at MMS last Saturday night. After starting on the front row Hall was as hot as the blistering afternoon sun as he dominated the 20-lap finale as he led every lap defeating Chris James and newly crowned South Australian Champion Melissa Crouch. Steve Agars, who was involved in a race long battle with Crouch for the final podium position, would finish fourth with veteran Michael Buxallen completing the top five. Kym Simon would be the last of the drivers on the lead lap in sixth with John McKenzie and Renee Pfeiler the last of the classified finishers. Earlier in the night Buxallen and Hall were the heat winners while Chris James was another driver who performed well during the preliminaries as he recorded a third and second placing. 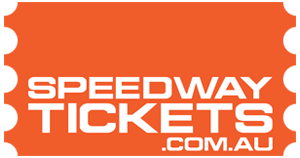 The meeting also featured Round 3 of the South Australian Wingless Sprint State Series with Australian Champion Joel Chadwick claiming his third-round victory in a slightly shortened A-Main. Chadwick was a well deserving winner as he led from the green flag and he managed to survive multiple restarts to defeat Matthew Kennedy and Jake Ashworth. But on the final restart of the race Kennedy almost stole the win as he put a massive slider on the National Champion in turn 1 only to have the caution come out again and the race declared due to the number of stoppages throughout the previous 23 laps of the race. Robert Heard, Jarman Dalitz, Brad Evans, Mick Barker, Normie Moore, Jaime Lee Andrews and Mark Taylor rounded out the top 10. Earlier in the night heat six was marred by a scary incident as Brett Ireland, who was debuting a brand-new car, was sent spearing into the turn four wall with the car bursting into flames. Luckily Ireland emerged from the heavily damaged car unscathed. Several Sedan classes were also on the program with Late Models, Street Stocks and Junior Sedans fronting for action with extremely competitive fields on all three classes. The Late Models started their night in spectacular fashion as before a lap was even run Steve Vaughan’s night was done after rolling his #67 machine in turn four. As the green flag came out for heat 1 Queenslander Brett Watson spun in front of the field with Fiona Verhoeven and Vaughan making contact with the spinning car with Vaughan flipping over the front of Verhoeven’s #8. Ryan Alexander would go on to win both heats on the night but came up one spot short as Mark McCarthy made a last lap pass for win in the 25-lap final. Alexander would finish second ahead of Jason Robinson, Verhoeven, Watson, Roger Oliver and Mat Crimmins. Nigel Reichstein continued his great form as he was victorious over Craig Buchanan and Heath Thorne in the Street Stocks while Drew Flatman defeated Sharni Pitcher and Chelsea Gwynne in the Junior Sedans. This Saturday night the Murray Machining and Sheds Murray Bridge Speedway will host the South Australian AMCA National Championship.